“The Ethics of Dealing with Difficult People in the Workplace,” January 17, 2019 with Andrew Elowitt, ProVisors East Valley Lawyers Affinity Group. “Best Practice of a Champion Delegator,” September 18, 2018 with Andrew Elowitt, ProVisors Valley Lawyers Affinity Group. “The ABC’s of Developing Your Firm’s A, B, & C Players,” July 20, 2018, with Jeanne Picht and Andrew Elowitt, 2018 Professional Development Consortium Summer Conference in Portland, Oregon. “Why Good Management Matters – 5 Traits of Champion Managers,” May 3, 2018, with Andrew Elowitt, Bruin Professionals, Warner Center Chapter. “Dealing with Difficult People While Practicing Law,” February 23, 2018, webinar with Andrew Elowitt, ABA Law Practice Division. “How to Deal with Difficult People at Work: Colleagues, Co-Workers, Clients and Opposing Counsel,” February 1, 2018, Beverly Hills Bar Association. “Best Practices of a Champion Delegator,” webinar with Andrew Elowitt, October 20, 2017, MassLOMAP. “How to Deal with Difficult People: Colleagues, Co-Workers, Clients and Opposing Counsel,” September 28, 2017 and October 10, 2017, with Andrew Elowitt, Managing Partners’ Roundtables. 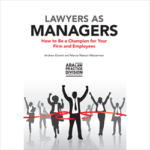 “Teaching Attorneys Champion Delegation and Feedback Skills,” with Andrew Elowitt, September 12, 2017, Greater Los Angeles Chapter of the Association of Legal Administrators. “Dealing with Difficult People at Work: Colleagues, Co-Workers, Clients and Opposing Counsel,” (with Andrew Elowitt), May 18, 2017, Bruin Professionals Lawyers Affinity Group. “How to Improve Your Delegation and Feedback Skills,” with Andrew Elowitt, March 7, 2017, Bruin Professionals, Beverly Hills Chapter. “Managing Partner & Law Firm Management – Working Together Efficiently and Effectively,” June 26, 2016, San Fernando Valley Section Meeting, Greater Los Angeles Chapter of the Association of Legal Administrators.